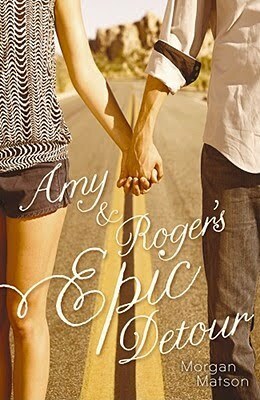 Amy & Roger's Epic Detour by Morgan Matson. Grades 9 and up. Simon & Schuster Children's Publishing, May 2010. Review copy provided by my local library. Amy Curry has not had an easy time of it. Her dad died. Amy blames herself. Her mom's avoiding her. Her brother's in rehab in North Carolina. And now Amy has to drive across the country because her mom's moving them from California to Connecticut. Only, after the accident Amy doesn't drive. So her mom's asked Roger, the son of family friends, to drive with Amy. The route's all planned, hotels reserved in such glamorous locations as Tulsa and Akron. But when Amy and Roger start off on their road trip, Amy makes an executive decision. She throws away her mother's carefully planned route and they decide to make a little detour. A little detour that will lead to the greatest adventure of her life, an adventure that will change everything and might just help her start to heal. Okay, now that that's out of my system, I can give you a clear and balanced Who am I kidding? This is going to be one of those gushing reviews that's actually just more of a rave. And I'm okay with that. What did I love? Well, first, I love the cover. And the title. Both really capture the feel and themes of the book. I felt like both Amy and Roger were completely believable characters, both searching for a way to deal with loss. Ms. Matson builds the tension really nicely, including occasional flashbacks to show readers a picture of Amy's father and the events leading up to the accident. It's natural that Amy would blame herself and she's working out her feelings of guilt as well as her devastation at the loss of her father. Amy keeps a road journal with notes about the places she and Roger go, updating it as they enter each new state. These sections with photos, receipts, road trip play lists, and journal entries, add to the text really nicely and make for a little something different. And they go to Louisville! I was so excited when I saw that Roger's ex-girlfriend lived in Louisville and they'd be stopping there on the trip. Ms. Matson gets Louisville right, too, with a trip to the Brown Hotel for hot browns and Derby pie (Amy and Roger are taken there by a rich person - only a rich person would take you to the Brown Hotel for your one meal in Louisville). I'm not the only one who loves this book! Check out more reviews at A Patchwork of Books, Stacked, in which a girl reads, and Write Meg! (among others). Amy & Roger's Epic Detour is on shelves now and I must insist you get yourself a copy of this perfect summer book.